Congratulations on your new arrival. Thanks to your breeder, your new puppy is insured for one month. The policy gives you up to £4,000 protection for vet fees, plus a host of other benefits. And the best bit? It’s FREE! 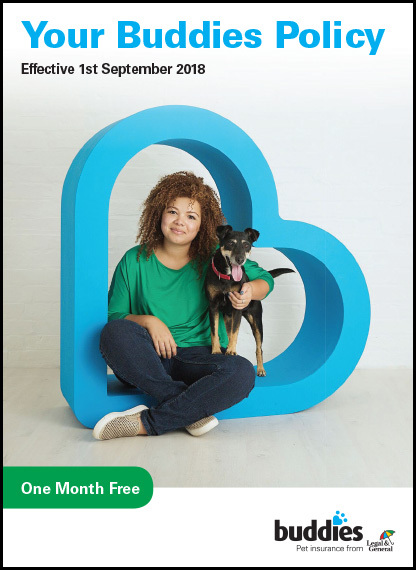 You can choose to turn your One Month policy into a full one, covering your puppy for a full year. You can see the full details of our policies here. Whichever one you choose, you can be confident that your puppy is covered by Buddies, the pet insurance from Legal & General – one of the UK’s leading financial services companies. Our experienced UK-based call centre is staffed by specialists who are pet-owners as well – so they really understand what it means to get the right cover for your pet. To ensure there is no break in cover, buy a full policy that starts as soon as your FREE policy stops.